MAGGIE LOESCH / STAFF PHOTOGRAPHER Philadelphia's skyline is visible over trees from the Cooper River in Camden, NJ, on the afternoon of Friday, June 29, 2018. 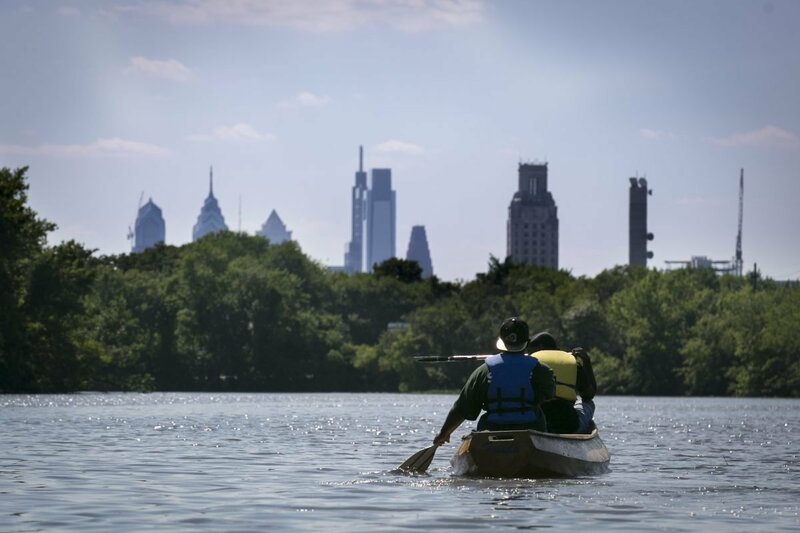 Students enrolled in the UrbanTrekkers program through Urban Promise Academy in Camden, NJ, led the canoe trip on the river. These teens are employed as RiverGuides for the summer and are trained in the ecology and history of the river, as well as canoe safety. Wilson is one of five Camden high school students who are spending the summer as “river guides” for the nonprofit RiverGuides program sponsored by UrbanPromise Ministries, a nonprofit that works with the city’s young. 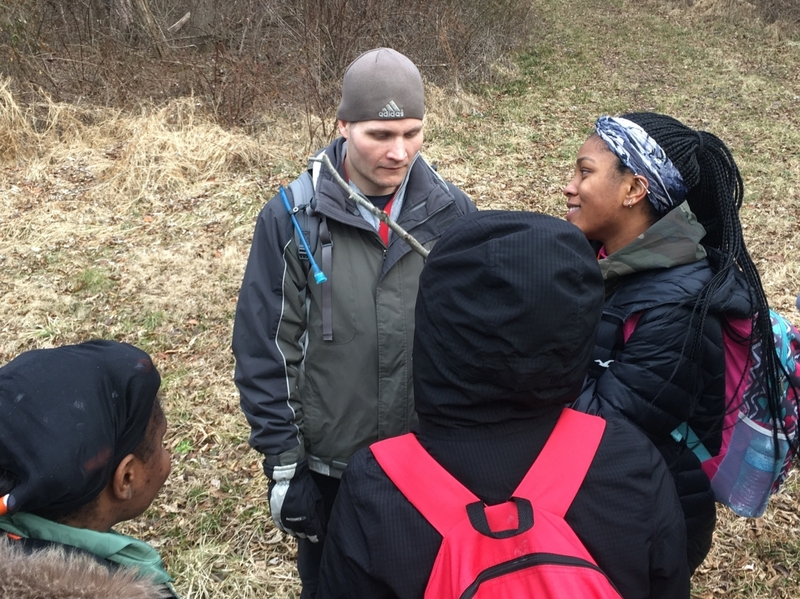 Founded three years ago through a grant from the William Penn Foundation, the RiverGuides program pays students such as Wilson to guide folks through the river. Camden residents paddle free of charge. Others must pay a small fee. Throughout the trip, the young guides narrate the local history of landmarks on the river and present ecological findings from their own research. 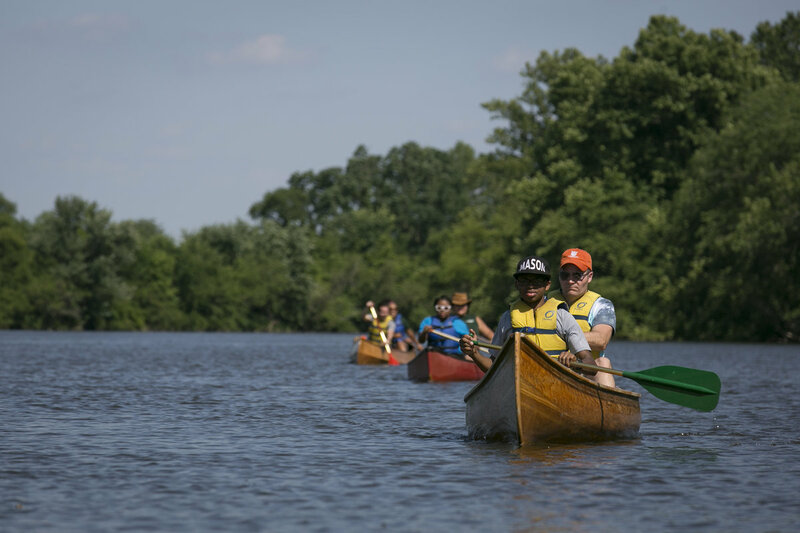 MAGGIE LOESCH / STAFF PHOTOGRAPHER Students lead a canoe trip on the Cooper River. These teens are enrolled in the UrbanTrekkers program through Urban Promise Academy in Camden, and employed as river guides for the summer. 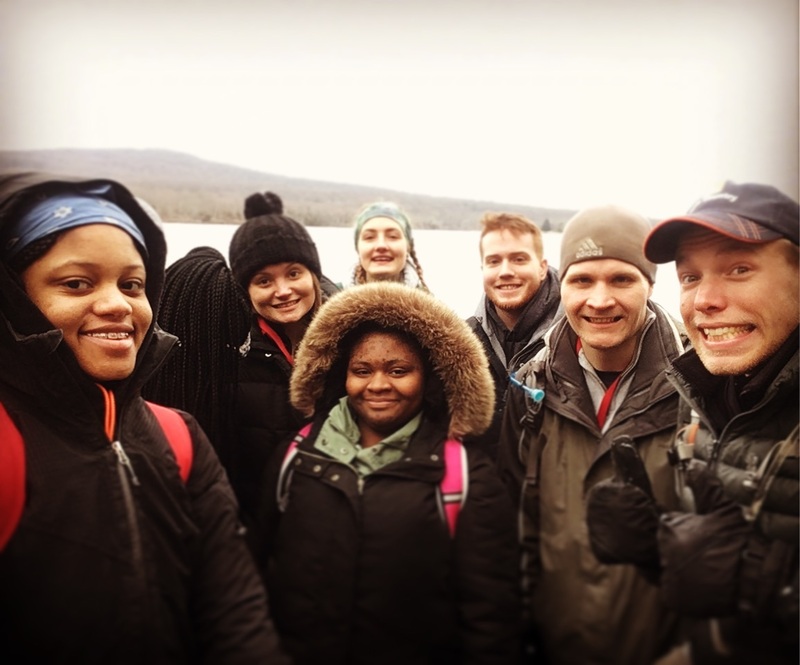 All RiverGuides expeditions are led by Wilson and this summer’s four other guides, joined also by two paid supervisors like Morales and usually one volunteer. The typical paddle is for the benefit of Camden residents who have never been on the river before, Morales said. 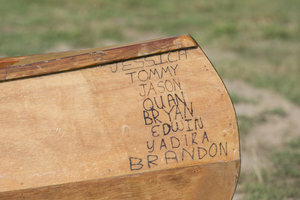 The canoes, most hand-built by students in the UrbanPromise Boatworks shop, hit the water near the Kaighn Avenue Dam. They traverse toward the Delaware River, winding among such landmarks as the Campbell’s Soup headquarters, Gateway Park, and the Federal Street Bridge. After roughly three hours, the trip ends at Pyne Poynt Park in North Camden where a shuttle returns participants to the launching point. The guides not only know the history of the Federal Street Bridge back to the American Revolutionary War, but they also gladly identify an amalgam of birds that have come to call the Cooper home. And as part of their job, guides conduct water-quality assessments on the river twice a week, testing for pH level, dissolved oxygen, turbidity level and nitrates. All tests come back within the standard range, the river guides said, and then explained the purpose behind each test. Wilson, in particular, took the lessons she learned with RiverGuides to heart. Now she’s returned for her second summer as a guide. Wilson said the RiverGuides program changed her life, and made her appreciate her city in new ways. Most who sign up for the tours have never been on a boat, Morales said, like most of the seven kids who came from Trenton last week to join the Camden guides. Those who hadn’t been on the water before were a bit shaky at first. 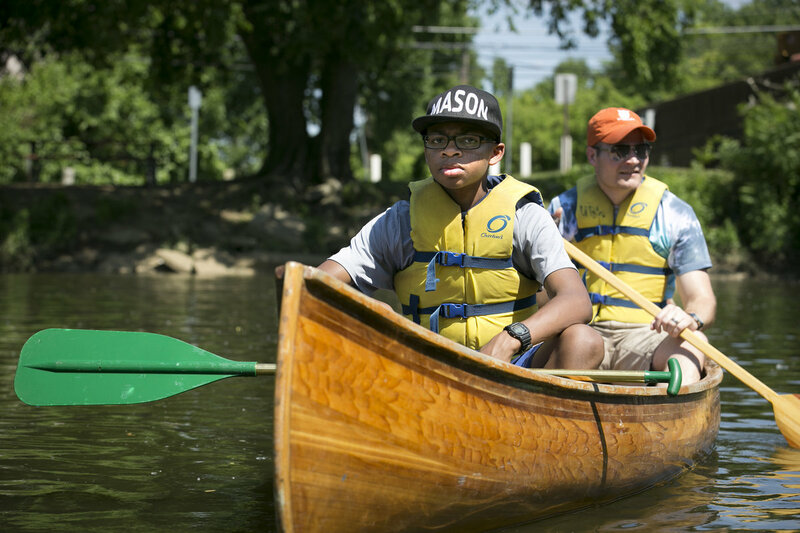 MAGGIE LOESCH / STAFF PHOTOGRAPHER Uriah Missouri (left), a 15-year-old who is part of UrbanPromise Trenton, and Eric Martin, leader of UrbanPromise Trenton, take a break from paddling on a canoe trip on the Cooper River in Camden. Teens from UrbanPromise Camden, a sister program of the one in Trenton, are employed as river guides for the summer and are trained in the ecology and history of the river, as well as canoe safety, and led the paddle. “Oh, Jesus, how am I getting in that thing?” asked Arianna Alexander, 15, just before the paddle. But as the group pressed toward the Delaware River, everyone became visibly more relaxed and comfortable with one another. Some raced, others collected litter, searched for birds. Still more lingered behind to chat. 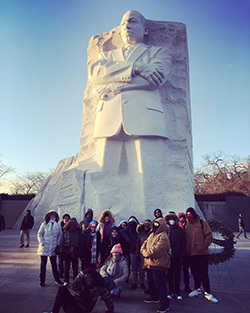 The kids from Trenton and Camden were joined last Friday by Maria Blatcher of Moorestown, who volunteered to help organize the trip. Camden’s poverty seems almost impossible to escape, even out on the Cooper River. As the canoes glide peacefully under bridges, it doesn’t take long to notice the glaring evidence of Camden’s reality, the makeshift living conditions of the city’s poorest beneath bridges. Blatcher said she was inspired to volunteer her time and effort when she saw a 20/20program on child poverty in Camden more than a decade ago. As it turned out, one of the river guides, Ivan Stevens, now 17, was featured in that 2007 episode. At the time, he and his mother and younger brother were homeless. Today, Stevens aspires to be a journalist, he said, and keeps a journal on him almost all the time. 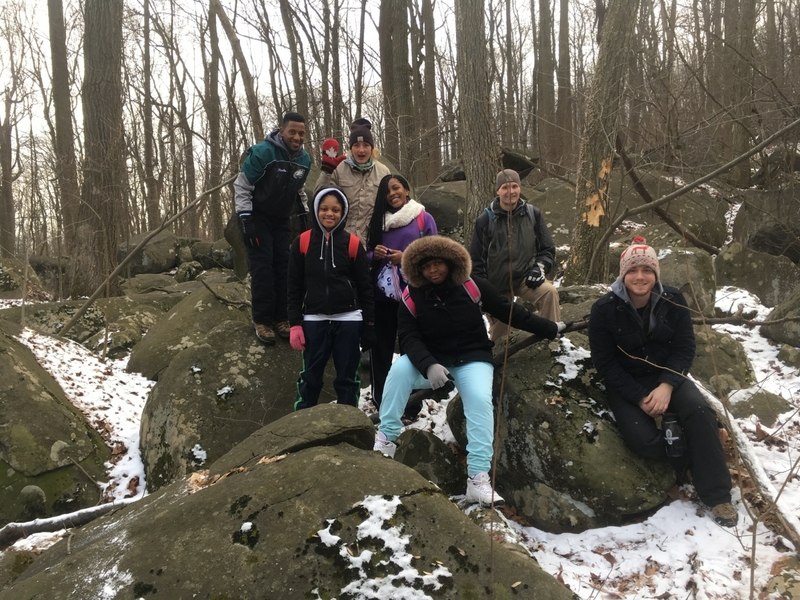 “Alright everyone,” asked Tyann, one of our 12th graders, “who wants to continue down the trail, and who wants to turn around now?” We had hiked a couple hours that morning on pretty flat ground around Lake Nockamixon, situated in a small state park in eastern Pennsylvania. We had the option of continuing another couple miles down the trail or turning around to head back to our cabins. 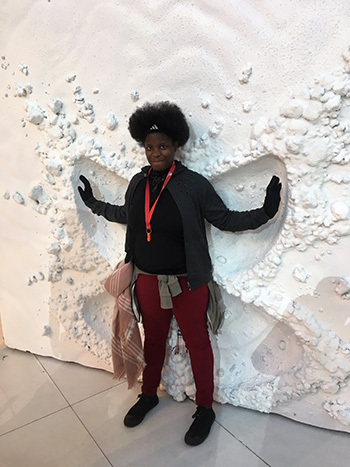 Tyann was our “leader of the day,” a role each student took on for a portion of the trip, including responsibilities of monitoring wellbeing of the group, keeping the group on schedule and on task, and making informed decisions based on the best interest of the group. Tyann put the decision to a vote- and found that one third of the group wanted to return, while about two thirds wanted to continue on. She was part of the group that wanted to return to camp. I was curious to see what would happen. The day prior, we spent time looking at four different leadership styles- directing, selling, consulting and engaging. Students and volunteers took a self-evaluation to see which leadership style aligned most with their personality. Directing leadership is mostly directive, Selling leadership looks to explain the reasoning behind a decision, Consulting takes others’ opinions into account before making a final call, and Engaging leaves the choice completely in the hands of the group. We had spent the prior evening talking about the pros and cons of each leadership style, and when was appropriate to use each of them. As Tyann consulted the group on our hiking route, she decided that because of the majority wanting to continue on, that we would keep going, but we were able to come up with a compromising plan which brought us to a beautiful lakeside lunch spot that fell in between our two options. Tyann put into action what she learned about herself the day before, laying aside her personal preferences to put the group first. She acted with confidence and thoughtfulness, making the experience the best one possible for everyone involved. Psalm 139:13-14 says, “For You formed my inward parts; You wove me in my mother's womb. I will give thanks to You, for I am fearfully and wonderfully made; Wonderful are Your works, and my soul knows it very well.…” Leadership takes on many forms. Each of our students were created uniquely by our loving and personal God. 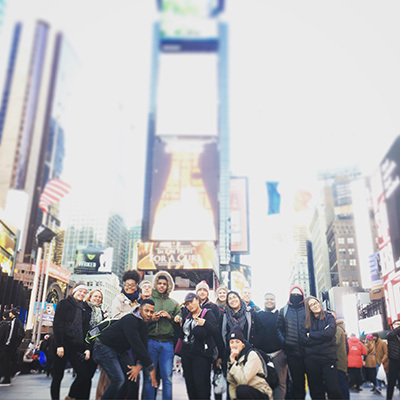 Anytime they can live out that uniqueness and discover the way their leadership can be a gifting to the group is a chance to reflect on the way God designed them to be. My hope is that they continue to flourish as leaders- whichever trail they decide to take.